The Looming 2018 Budget Crisis! Welcome to "Newtown News Update"! The opinions expressed here are solely the personal opinions of John Mack and do not reflect the opinions of any other person or entity. If you are not a subscriber, please subscribe here. If you are a subscriber and do not wish to receive further updates, please use the "Unsubscribe" link at the bottom of this email. At a contentious public meeting on December 13, 2017, the Newtown Township Board of Supervisors (BOS) debated whether to cut spending for essential services (again) or to approve the 2018 budget with new taxes to pay for Emergency Medical Services and Fire Hydrant Maintenance. Recall that at the November 21, 2017, BOS meeting, it was decided to publicize a proposed budget that included a 0.45 mill new tax specifically earmarked for the ambulance squad and a 0.55 mill new tax specifically for fire hydrant maintenance (read “BOS Approves Publication of Preliminary 2018 Budget”: http://bit.ly/2BoCyat; also view a video of Mr. Evan Resnikoff re-iterate his plea for an EMS tax millage at the December 13, 2017 meeting: https://youtu.be/ppcegit2gA8). By implementing new taxes to cover these expenses, the Township will save approximately $305,000 (previously, $120,000 from the general fund was allocated to the Ambulance Squad and $185,000 for fire hydrants). At that same meeting, BOS Chairman Kyle Davis reluctantly went along with adding the taxes to the preliminary budget but asked Town Supervisor Kurt Ferguson to come up with cuts to the budget as an alternative means of saving $300,000 or more. The motion passed and Mr. Ferguson presented a bevy of suggested cuts at the December 13, 2017, BOS meeting (see chart below). 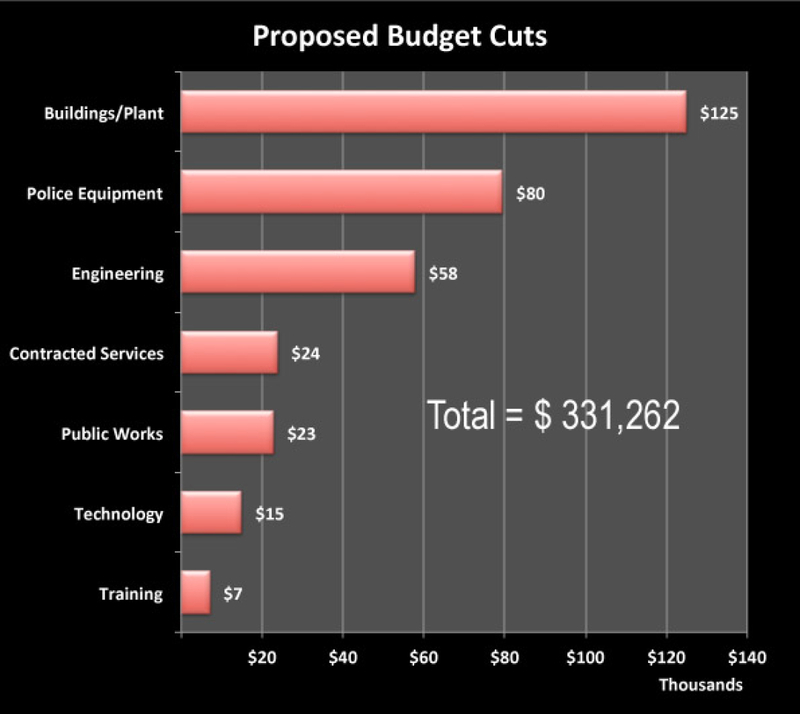 The proposed cuts would significantly impact public safety and the environment. For example, to save $79,500, the number of police cars purchased in 2018 would be cut to 2 instead of 4. Currently, the police department has 16 patrol cars that rack up significant number of miles per year. Some cars have over 140,000 miles on them. To keep the fleet in good condition, at least 3 cars per year must be rotated out and replaced by new ones. The proposed cuts would also eliminate GIS-based fire hydrant maintenance system updates. 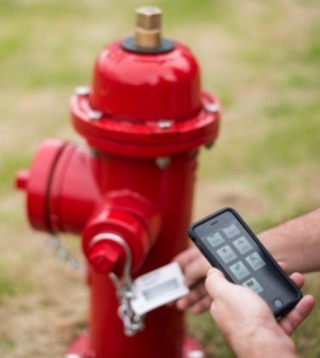 A Geographic Information System – GIS – is used to mark exact locations of fire hydrants. Instead of using addresses or approximate locations, the Fire Department would have precise coordinates. Not only does this help in the event of a fire emergency, but also in the day-to-day maintenance of the hydrants. This system is designed to save time, money and make the town safer. 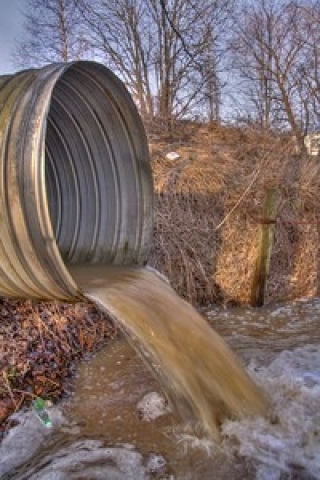 The Pennsylvania Department of Environmental Protection requires municipalities to manage stormwater pollution by runoff from impervious surfaces such as streets and sidewalks. Such runoff can pollute rivers and streams. The township will have five years to complete mandated DEP stormwater management and pollution reduction projects, which could run into millions of dollars in the worst case scenario or at least hundreds of thousands in the best case according to Ferguson. The proposed cut of $125,000 in the 2018 budget would mean that funding for these projects will be kicked down the road for future supervisors to deal with. Note: this is the “Buildings/Plant” category in the above chart. The list goes on. But the cuts were not deep enough according to “lame-duck” Supervisor Gerry Couch who suggested additional cuts that would negatively impact the quality of life for many Newtown residents, especially the youngest residents! “I think you have a lot more in there that could be considered [for cutting],” said Couch who brought up as an example improvements to Veteran’s Park, including installation of bleachers in four fields, a 50-foot flagpole with lights, and pocket playgrounds for children. “Whether people are willing to have their taxes raised to pay for [these improvements] I don’t know,” said Couch who appeared a bit confused. Chairman Kyle Davis, however, clarified: “We’re not proposing raising taxes for parks and rec,” said Davis. In the end, the Board could not agree on how to move forward and create a final budget for approval. Instead, Chairman Davis suggested that members “digest” the feedback and comments made at the meeting and make a final decision at the scheduled December 27, 2017, meeting. Ferguson pointed out that he would not be able to come to that meeting with a prepared budget for approval. Instead, he would have to take the final numbers agreed upon that night and go back to his office during the meeting to draft the final resolutions that would correspond with any changes made and come up with the final budget approval package. The December 27, 2017, BOS meeting promises to be a long night and, unfortunately, a very sparsely attended meeting. Anyone who is interested in ending Newtown’s deficit spending and securing adequate funding for medical and Fire services should attend this meeting and tell the board how they feel in public comments. A funny thing happened to me on the way to the December 13, 2017, Newtown Board of Supervisors meeting. Well, not really funny, but gratifying! 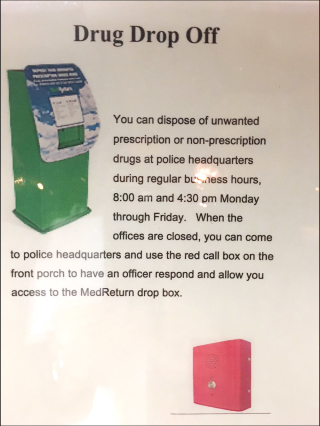 This notice was (and is) posted to the front door of the Municipal Building telling people that they now can drop off their unused drugs - including opioid pain medications - at police headquarters even when the office is closed after 4:30 PM, before 8:00 AM and on the WEEKENDS! All you have to do is use the red call box on the front porch of police headquarters and an officer will respond to give you access to the drop off box. Hopefully, the response will be as quick as possible. Although this is not as convenient as a 24/7 drug drop-off box that I advocated when campaigning for Supervisor, it is probably the best option for now. It's gratifying because my comments before the BOS and discussions with Police Chief Henry Pasqualini has paid off. Thank you Chief! 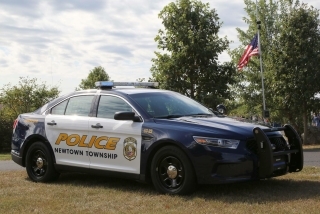 The Newtown Township Board of Supervisors is accepting resumes for consideration for Township boards, committees, and commissions. Resumes will be accepted until December 20, 2017. Please submit a letter of interest and resume to Olivia Kivenko, Newtown Township, 100 Municipal Drive, Newtown, PA 18940, by email to oliviak@newtownpa.gov, or by fax at (215) 968-5368. 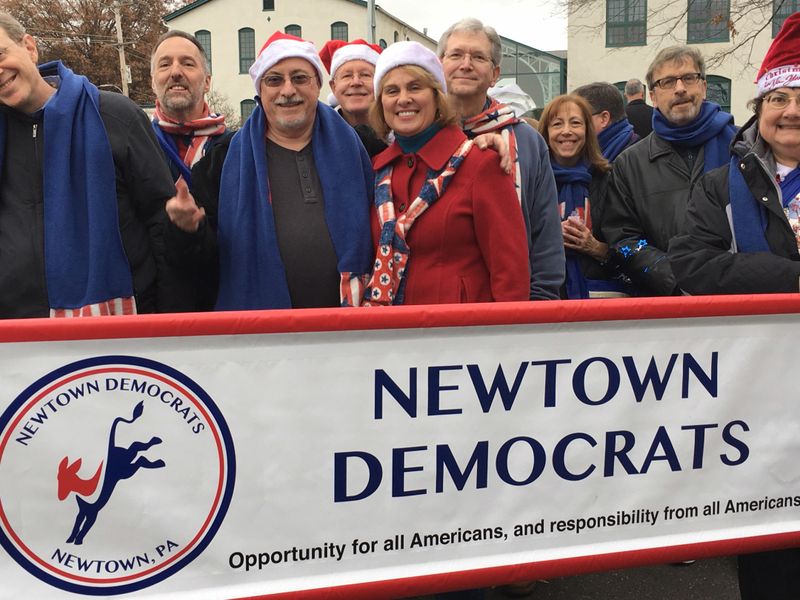 The Newtown Democrats prepare to march in the annual Holiday Parade. 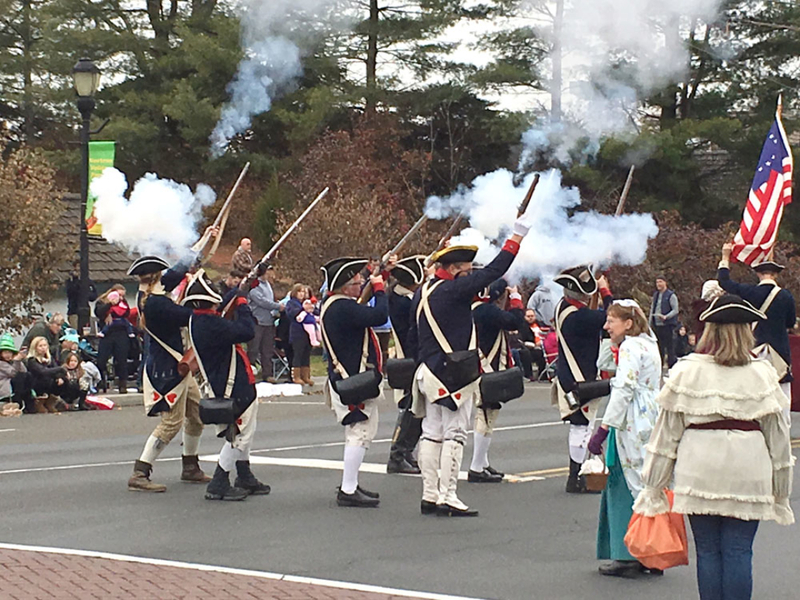 Revolutionary War re-enactors fire their guns in the annual Holiday Parade.